Tim Zimmermann won the day, below is his write up. 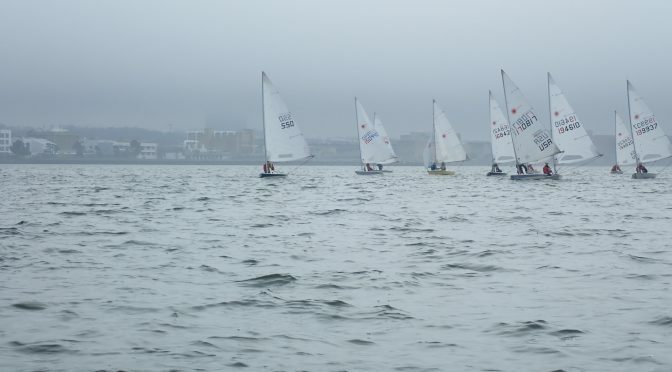 It was a perfect day for Laser racing on the Potomac: not frosty at all (temps in the 60s) and a light sailable breeze from the SSE at 4-6, shifting to SW and increasing a bit. The first course was set up in the channel. There were plenty of boats racing and a shortish line, so getting a good start (not usually my strong point) was key. The line seemed to be slightly pin-favored and in the first race I set up a few BLs short of the line with about a minute to go because I expected boats to be up on the line fighting for a place in the front row. The tide was coming in, and held boats off the line, so it was easy to hang loose until 10 seconds, before accelerating for the gun. And perhaps because of the current many boats were off the line as the clock counted down, so there was room to put the bow down. I got a good start, and legged out toward the left looking for a header to hitch back to the middle on. The breeze looked okay on the left, and better in the middle. It also looked okay on the right, but up against the shore line it might be unreliable. Boats started to flip over behind me onto port to go back to the middle and I hung on for just a bit longer, lucked into a header and tacked back toward the middle. That was just enough to get a little cushion on the fleet and I was free to sail the shifts up to the windward mark and held that lead twice around, finishing downwind. It was a reminder of how easy tactics and sailing the shifts can be when you are not worrying about clear lanes. Sometimes things just go your way, and the second race was almost the same as the first. I got another good start and sailed left with Robert Bennett on my windward hip. With the tide very low, I gave him a heads up that I would call for room to tack as the water got thin, and he courteously tacked away. I sailed a few more boat lengths, and tacked into a nice little lift (I wish I could say I planned it that way, but…). So again I had just enough lead to play the shifts and the fleet up to the windward mark, and established a nice cushion that held up twice around.